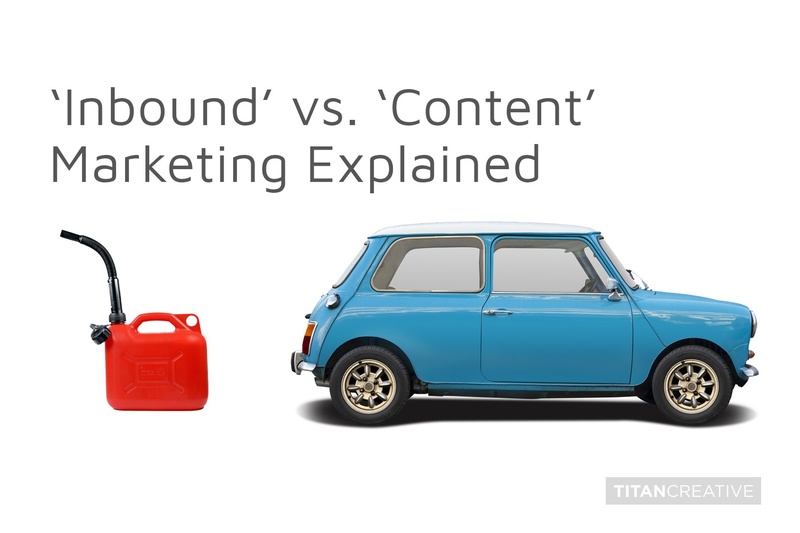 What is the difference between Inbound and Content Marketing? Two different — but related — ideas. One makes the car 'go' and the other is the vehicle itself — the engineering and design of all the assembled and integrated technologies that allow you to leverage the energy created by the fuel, to gain momentum and go somewhere. The vehicle, in a marketing sense, is an overarching strategy that is based on full visibility, metrics and integration with every prospect touchpoint. 'Content marketing' has been a mainstay of digital lead-gen strategies for a while. It refers to the general idea of creating and promoting relevant content that can help generate awareness and engagement among a defined audience. It traditionally leverages keyword strategy to try to improve how easy it is for prospects to find your solution via online search. Let's face it, the idea that content should be relevant to an audience does not require a PhD. Actually making it relevant does require some thinking, and there are some great content marketers out there who are creating some on-point, helpful content on a regular basis. (Two of my favourites are Tangerine's Forward Thinking blog, and Bell MTS's Business Hub). In business, everything is content. Every web page, every product brochure, every sales deck, every social post, every touchpoint with a prospect says something about your offering, your solution, your brand. Content has been at the heart of marketing since the dawn of commerce. This accounts for your clogged up inbox, and your endlessly refreshed and updated LinkedIn feeds where more 'thought leaders' have emerged than you ever thought possible. They share content, ideas, thoughts, challenges, problems, solutions. No doubt there is a some genuinely good content in this sea of white content noise. Whether or not content is in fact relevant and useful, 'content' on it's own is not a strategy. It's the fuel for a strategy. 'Inbound' is an end-to-end marketing methodology that leverages relevant content as part of a wider, integrated strategy. It places buyer persona at the very center of every experience, and neccessitates that content be executed for each stage of that persona's Buyer's Journey (Awareness, Consideration and Decision). It is wrapped in a delivery mechanism (metrics, automation, lead handling methodology) that draws prospects further along that Buyer's Journey. It endeavours to create a frictionless customer experience, end-to-end, in which a prospect comes towards your solution versus you pushing it out to them. So it's accurate to say that 'content marketing' is a component of the Inbound Methodology. On its own, it's simply a tactic that can be used sporadically in different ways, at different times, by different teams. As part of a wider, intelligently-designed customer-centric nurture experience, it's the fuel for something much bigger. For more information on the difference between Inbound and Content marketing, here's a recommended read. Learn about our fully-managed, ongoing strategic content service. Scott Lanaway is Principal and Creative Director at Titan Creative Inc., a provider of strategic creative and digital marketing services for clients across North America. PREVIOUSThe Inbound Buyer's Journey | Decision Stage – Why You?